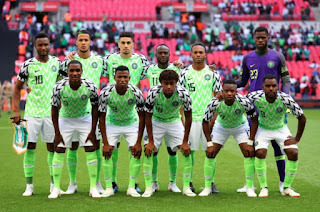 Nigeria dropped from her previous 44th position to 46th in the FIFA Coca Cola World Rankings. The Eagles maintained its 1427 points from the previous list in December. The Asian champions, Qatar climb to 55th in the world, gaining 38 places and reaching their best position since 1993. According to FIFA statement, the Asian Cup has been responsible for the notable changes in the rankings, with the scarcity of games in other confederations leaving the top 20 unchanged, and Belgium still in pole position. Fellow finalists, Japan (27th, up 23) have also soared up the order, while Korea Republic (38th, up 15), United Arab Emirates (67th, up 12) and Jordan (97th, up 12) all registered double-digit gains. There were also significant upward moves by the likes of Iraq (80th, up , Iran (22nd, up 7) and Uzbekistan (89th, up 6). Another consequence of these changes is that Asia has boosted its numbers in the Ranking’s top 50. The Asian Football Confederation is now represented by four teams up, one on the last edition, and now stands level with Africa, whose numbers have been depleted by Congo DR (51st, down 2) dropping out.